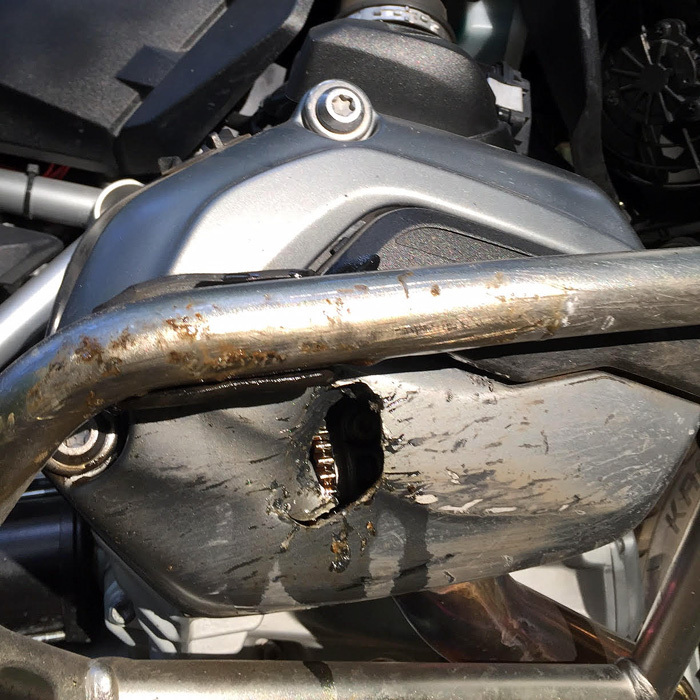 Exposed – Hole in Head, despite Crash Bars! There’s a lot of space in between crash bar steel tubing – hard stuff can get through. X-Head cylinder guards fill the voids, do not break, and protect the vulnerable cast valve covers. Lori, who bought X-Heads and sent us ths photo wrote, ” I’m so excited to be able to prevent another incident like this”. X-Head_LC fit R1200GS_LC with Touratech Crash bars. Just wanted to let you know they (X-Head_LC) fit under the Touratech bars. You have to remove the lower bars to do it properly. It seems to “slip” in-between the bars and you think you can mount the X-Head without removing the bars – but you cannot. However, as I said before if you remove the Touratech lower bars you can install the X-Head and then the bars fit right back on and it all works out well. I put both on because I had a fall in a rock garden and, while the bars keep the bike from ripping things off, many rocks went between the bars and put deep gashes on my covers. I am hoping this will give it the most protection for the next dump the bike takes. X-Heads have been successfully fitted with crash bars made by BMW, Touratech, SW Motech and Alt Rider. Fit and compatibility of BMW or aftermarket crash bars with X-Heads may vary, depending on their manufacturing size accuracy and any running changes the manufacturers may have made over time. 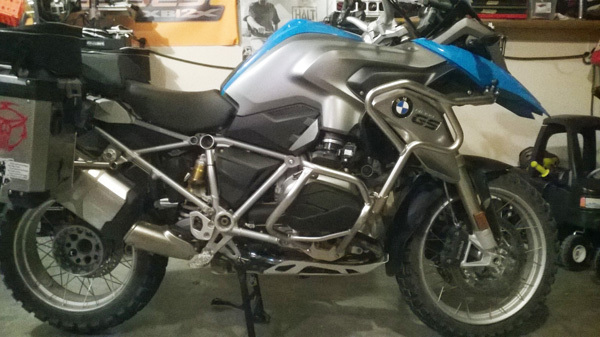 By email from Frank F.
I am awaiting delivery of a 2014 R1200GS LC in early March. I will ride the bike mostly two-up on both street and dirt, but probably do more gravel/FS roads and off-road than most people do on their GS bikes. Here in CO, the tertiary mountain roads are often rocky and loose, as you probably know. Tip-overs and slow falls have occurred on our trips and likely will with the new bike. I am grappling with the question of whether to buy crash bars or not. It seems that the most likely scenario for a tip-over on a rocky trail would be puncture of the valve cover by a sharp rock and crash bars might not prevent this from happening at all. It seems to me that crash bars are more useful in higher speed falls and what I really need are your valve cover protectors. The bike will probably come to rest on our luggage bars and the cylinders as they already stick out. Any comments and insights are appreciated. Regarding using crash bars or not, for mostly street riding either X-Heads or crash bars will be sufficient. Some riders do not like the look of all that plumbing around the engine so opt for X-Head guards instead. X-Heads are designed to cover 80% of the face of the head to protect, not only the bottom/front initial impact area in a drop, but also the upper part of the cylinder head. Even in a stationary drop in a driveway, inertia can cause a bike to roll partially onto the face of the head before it settles down. For off-road riding, X-Heads alone are very effective because of their broad coverage and the Super Tough Nylon material we use is the best that can be had for this application, preventing breakage and punctures. For heavy duty riding and frequent drops in rough terrain, X-Heads complement crash bars to protect heads from weird strike angles onto rocks that can get past openings in the bars, especially at the rear part of the cylinder. Adding bars is another layer of defense. X-Heads for the GS_LC were designed with clearance for BMW’s crash bars in mind so you will be able to fit them at any time. X-Heads also fit with Touratech and Alt Rider bars.